How does it feel to live under the threat of extinction in one's own home? Well, ask an animal. Man - the supposedly 'superior' of all creatures, who is said to have been made in the very image of God - is the strangest compound of extremes. If he wills, he can destroy and it but he who can save. Nature's non-human inhabitants are the worst sufferers in this war amongst 'unequals'. And, once again, like impenetrable sentinels men have stood up against the brutes in their race to protect these innocent sufferers. Yes, this verbal galore was about wildlife conservation. Conservation efforts began early, but it took India decades to get them implemented. Today India has 441 wildlife sanctuaries and 80 National Parks protecting threatened species like the Bengal tiger, one-horned rhino, Asiatic lion, Nilgiri tahr and so on, of which the Indian jungles are the only habitat of a few. It not just about some animals freezing into pages of books and websites, but conservation is mandatory because the ecological balance of nature, especially that affecting the food chain, has to be maintained. Indian goverment initiatives like the Nature Camps and Jungle Lodges serve the dual purpose of promoting wildlife awareness among the people and encourage eco-tourism. Project Tiger (1974) : It began in 1974 by knitting wildlife forests across the nation under the banner of 'Tiger Reserves' and within decades the tiger population shot from a mere 1827 in 1972 to 40,000 by the turn of the century. Jim Corbett National Park was the first one to be branded the appellation. Wildlife Protection Act (1972) : This Government of India initiative aims at effectively controlling poaching and illegal trade in wildlife and its derivatives. This has been amended recently (January, 2003) and punishment and penalty for offences under the Act have been made more stringent. 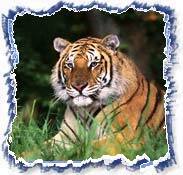 WWF : Species conservation within WWF-India began in 1997 with the initiation of the Tiger Conservation Programme. Subsequently in June 2000, it diversified into conservation programmes targeted at Asian Elephant and Rhino. Wildlife Conservation Society-India (1986) : Initiated in the Nagarhole by Ullas Karanth, it is one of the major groups working in this area with activities encompassing scientific research, national capacity building, policy interventions, site-based conservation and developing new models of wildlife conservation. Indian Elephant (Elephas maximus) : Corbett National Park, Kaziranga National Park, Dudhwa National Park, Nagarhole and Bandipur National Park, Periyar National Park and Manas National Park.